Down East Outfitters manager Vaneta Bodine straightens clothing racks Thursday morning at the Tooele store. A gain in retail employment helped drive the annual unemployment rate down for 2012. 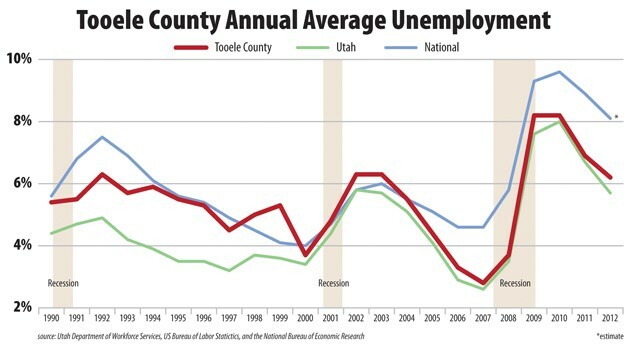 After three years of increasing unemployment, Tooele County’s jobless rate dropped for the second consecutive year in 2012. The annual unemployment rate was 6.2 percent, down from 6.9 percent in 2011. Yet, it was still well above the county’s 20-year average of 5.4 percent, according to statistics released last week by the Department of Workforce Services. For comparison, the 2012 annual unemployment rate for the state was 5.7 percent while the nationwide jobless rate was estimated at 8.1 percent. Furthermore, after a 20-year low of 2.8 percent in 2007, the county’s jobless rate climbed to 3.7 percent in 2008 before skyrocketing to 8.2 percent in 2009 and 2010. The decline in the county’s 2012 jobless rate is tempered by the fact that it remained flat at 6 percent for the last four months of the year. For the entire year there were only three months of job growth in the county. Such low growth indicates the unemployment rate was largely driven down by residents commuting out of the area in search of work, according to Jim Robson, regional economist with the Department of Workforce Services. Most were likely going to Salt Lake County, which had a 3.7 percent job growth rate last December. In September 2012, the most recent month with available employment by job sector data, the local construction industry gained 180 new jobs compared to September 2011 for a 27.2 percent growth rate. Retail trade also added 117 new jobs in the county over the same time period for a 7.2 percent increase. However, job creation in the county during September 2012 was offset by a loss of 359 jobs in the industry sector from EnergySolutions, and Deseret Chemical Depot’s contractor, URS. 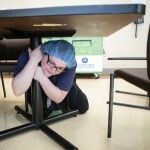 Robson described the county’s economy as “sluggish,” caused by lingering effects of the recession, federal job cuts, and layoffs in the waste management industry. 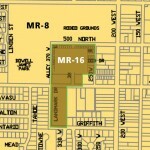 He also noted Tooele County government’s workforce reduction as another contributing factor. Robson predicts that while the job market in the county will continue to contract, employment outside the county will keep employment stable. Tooele County Commissioner Shawn Milne, who oversees economic development activities for the county, expects the next six to 12 months to remain stagnant. But he is encouraged at the number of businesses that are considering to locate here. Milne cautions that these companies have not made a commitment to do business here, but the amount of interest shown by them and other companies is encouraging. 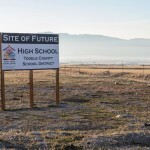 “The county’s goal is to work with the Governor’s Office of Economic Development and the Economic Development Corporation of Utah to bring more jobs in Tooele County that pay a livable wage,” said Milne.